Prepare to make a difference as an effective, ethical financier. Our experienced faculty will guide and grow you. You'll have opportunities for experiential learning, including managerial finance, international economics, portfolio management. In our Financial Markets Lab, you'll learn to use Bloomberg Terminals to analyze financial data and metrics. You'll even have a keycard to access the lab at any time. You'll have internship and study abroad opportunities. You'll be part of the Lipscomb team that competes against other universities in the TVA Investment Challenge. You and your team will manage a portfolio of securities on TVA's behalf. Each team competing will be responsible for security selection, portfolio balancing and other fund management decisions. With rigorous and relevant curriculum, chances for hands-on learning and real-life experience, you'll have the foundation you need to thrive. 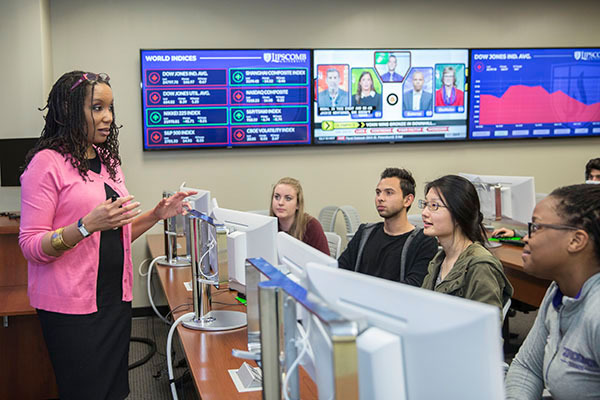 A foundation of sixteen required business core courses provides our finance majors an understanding of financial institutions and different types of asset classes. Prepares graduates to work in finance functions in corporations. Prepares graduates to work with individuals in wealth management. You'll complete a part-time internship in a finance-related position (at least 20 hours per week). You'll also join the Lipscomb team that competes against other universities in the TVA Investment Challenge. At least a grade of "C" is required for all upper-division finance courses included in the major. The course must be re-taken if a grade lower than "C" is received.